Science Objects are two hour on-line interactive inquiry-based content modules that help teachers better understand the science content they teach. This Science Object, co-developed between NOAA and NSTA, is the first of four Science Objects in the Coral Reef Ecosystems SciPack. It explores the unique and diverse ecosystem of the coral reef. Coral reefs are very complex systems that create one of the largest structures on Earth of biological origins. Thousands of coral species exist in oceans worldwide. Reef-building corals remain on the same spot of the sea floor through their entire lives and have developed reproductive, feeding, and social behaviors suited to their situation. As they grow, reefs provide structural habitats for hundreds to thousands of different organisms. I learned a lot from this resource. Beautiful photos and create animations to introduce coral reefs. I really enjoy Science Objects. In 1-3 hours, the Coral Reef Ecosystems: The Living Reef Science Object will help me re-learn, refresh, or learn for the first time some critical science concepts I will have to know to obtain my Science Educator credentials. I appreciate that I can complete them at my own pace, and that, if used as park of a SciPack, I have access to a content expert to go to for help. The NSTA Learning Center Science Objects are really beneficial! I enjoyed this Sci-pack. It was easy to follow with much information and it helped me in my understanding of coral reefs. This focus on life in the reef is very powerful instructional material to provide evidences on the importance of marine ecosystem and their balance in existence and dependence on abiotic factors too. This lesson teaches the habitat, reproduction, growth, and forms of corals. 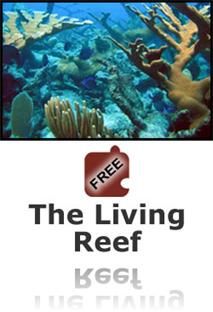 The Living Reef is a good introduction to organisms called coral. I really liked this SciObject. I did not really understand what they offered and the ease of learning new content they offered. This module is on the Coral Reef Ecosystems. I felt the integration of voice, interactive images, multiple pictures and shorter, easy to read paragraphs broke the concepts of the Coral Reef into manageable learning. I also find the common misconceptions by students valuable..although I don't know if I agree with all of them. At the end it offers a linked scipack..which is interesting because now the interactives can be opened up for use in the classroom and a subject matter expert is available by email!!! This Science Object is an excellent introduction the basics about coral reefs life. This Science Object covers information about types of corals and types of coral reefs. It includes information about coral anatomy, coral photosynthesis, coral reproduction and about reef building. Assorted photos are provided to enhance the text. There are several locations where you can check for understanding by answering questions which can be checked for correctness. There is an opportunity to have the information read to you as well as a glossary to reinforce vocabulary. This is a great source of general introductory information about a coral reef that would provide a strong background foundation for either an educators or a student to learn on their own. This was a good piece. It is sad to see that people are careless when it comes to the coral reef and taking care of it Great pictures. The pacing, inclusion of pictures, periodic self assessment quizes make this a good lesson. Students in a differentiated classroom could easily use this tutorial in the classroom or at home to cover the topic on reef growth, types, organisms, etc. There was some disappointment when the video on synchronous reproduction didn't work and I wish there had been a table of contents that was checked off as one proceeded through the supposed 8 pages. Each of the 6 sections had many pages so you never knew how much more remained - pacing in a classroom might be a problem. The scipak was in a well planned format with misunderstandings periodically highlighted. This science object provides solid introductory information on a variety of topics using coral reefs as the overall subject. In addition to the structure of coral and the formation and evolution of coral reefs, the topics of photosynthesis, symbiosis, predator/prey relationships, and strategies for prey to evade predators are presented. I like the use of the coral topic to integrate many ecology and classification topics, but there is not much detail beyond a basic presentation. There is an interactive for placing different organisms into their proper place on a coral reef that could be useful as a class activity.